Srilatha, a resident of Malleshwaram, was busy with her morning chores when she heard a pack of dogs barking outside her home. After a while, she noticed that her cat was missing. They searched for the cat in the neighbourhood, and finally saw her perched in the side railing of a neiighbour’s house. On a closer look, they saw that the cat had been badly injured. the dogs had chased and mauled her. Finally they had to rush her to Veterinary Hospital in Hebbal, where she underwent a major surgery. The cat is still recovering. This is the scene in almost every neighbourhood in the city. Bruhat Bengaluru Mahanagara Palike (BBMP) has not undertaken Animal Birth Control (ABC) programme for last three years in the city, as a result of which population of street dogs increased multiple times. Many nongovernmental organisations and concerned citizens demanded that ABC programme restart, and as a result now we have the ABC programme back. BBMP officials are visiting all areas to catch street dogs and sterilise them. Handling street dogs in a municipal area falls under Animal Birth Control (Dogs) Rules, 2001. According to these rules, a dog can be captured by the dog control cell in the municipality area following specific complaints. Complaints can be on dog nuisance, dog bites and information about rabid dogs, and necessary actions can be taken. Read the full rules here. 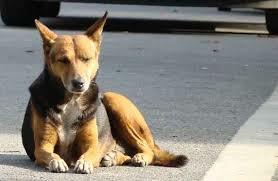 Whom to call when you have street dog problem in Bengaluru? One needs to call BBMP control room 080-22660000 to find out the concerned officer for the particular zone. When someone complains about street dogs, it should be attended to on priority basis, irrespective of the area from which the complaint comes. A dog squad usually consists of the van driver, two or more BBMP employees trained in capturing of dogs, and a representative from any animal welfare organisation. All members of the dog squad are expected to have identity cards. What does the dog squad do? Once you call and place the complaint, based on the nature of the complaint, the dog squad schedules a visit to your area. If the complaint is of emergency nature, about a sick or rabid dog, the action is generally immediate. If the problem requires just neutering, the team schedules a visit and comes to pick up the dogs. This year the visits will be a bit delayed as they have a lot to backlog, as the ABC programme had been inactive the past few years. The squad will use a lassoing or soft-loop animal catchers as prescribed under the provisions of Prevention of Cruelty (Capture of Animals) Rules, 1979 to capture the dogs. All the dogs caught will be tagged for identification so that they are released in the same area after sterilisation and vaccination. A dog van cannot be crowded, and the dogs need to be properly cared for, while they are in the custody of BBMP. The BBMP should also maintain records of the area/locality, date and time of capture, names of persons in the dog squad on that day, and some details about the dogs captured such as number of male dogs, female dogs, puppies and so on. The captured dogs will then be brought to the dog kennels or dog pounds managed by the Animal Welfare Organisations (AWOs). These dogs will be examined by the veterinarians following which the healthy dogs are segregated from the sick ones. How does the sterilisation happen? The dogs captured are then sterilized and vaccinated under the supervision of expert veterinarians of the hospitals run by the Society for Prevention of Cruelty to Animals (SPCA), Animal Welfare Organization or other dog shelters. The method of sterilisation has grabbed the attention of the activists these days. The dog is injected an anasthesia and a surgery is conducted to sterilise it. The surgery is done in traditional method and healing of the cuts takes some time. Sterilisation of female dogs is a bit more complicated than male dog sterilisation. Animal activists in Bengaluru have launched a campaign demanding for keyhole / laparoscopic surgery while sterilising dogs. The petition on Change.org says that this method of surgery is already being done in Sarvodaya and CUPA animal welfare centers, and asks the government to adopt it. Sterilized animals live longer, happier lives. Spaying eliminates the stress and discomfort that females endure during heat periods, eliminates the risk of uterine cancer, and reduces the risk of mammary cancer. Neutering makes males less aggressive, prevents testicular cancer, and reduces the risk of prostate cancer. Altered animals are less likely to contract deadly, contagious diseases, such as feline AIDS and feline leukemia, that are spread through bodily fluids, says a note from People for Ethical Treatment of Animals (PETA). While all male dogs can be neutered, pregnant female dogs cannot be aborted or sterilised. They can be sterilised only after they have puppies. They should therefore be released and picked up only after they have had their litter. Once the dogs are neutered or spayed, the BBMP subsequently releases the dogs in the same place from where they were captured. The ears of sterilised dogs are clipped in a V shape, to help people know that they are the sterilised dogs. Generally dogs are happy when they get enough food. Their population increases in an area where there is garbage and free waste food available. Dogs sometimes even migrate from area to area in search of food. They generally live in pack and help each other. Keeping the area clean is therefore the first step towards avoiding street dogs’ menace. Once a dog is neutered and let back in the area, it continues to live and feed on the same sources as earlier. But veterinary experts say that dogs become less aggressive after being sterilised. They get used to people living nearby and become friendly, but any strange activity, presence of strangers, or new animals disturbs them. A dog barking in your neighbourhood is also the symbol of something being wrong, so it’s always best to check it out. High frequency noises from fast-moving vehicles disturbs the dogs in the locality, who launch a mass barking campaign against such vehicles. It is well-known that high frequency monotonous noises from loudspeakers also disturb the dogs, casing them to start howling, imitating the noise. 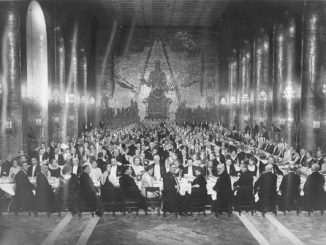 Reducing the volume of the loudspeakers in question and keeping them limited to the legally permitted decibels is the right solution to this problem. If you have a street dog that you usually see in your neighbourhood, feed the excess food at your home which you would otherwise throw in the waste bin. 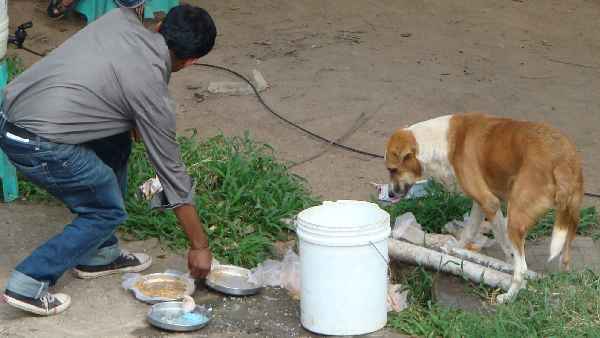 In fact there are some people who feed freshly cooked food to street dogs. The point of providing food to these street dogs is that it keeps them well-fed, which in turn means that there are lesser chances of them fighting with other dogs for food. Not all dogs are street dogs by birth. Sometimes people adopt dogs, then let go of them when they cannot manage them for whatever reason. Such homeless dogs that have nowhere to go also end up living on streets. If a dog that has collars is seen on the streets, in all likelihood, it could be a dog that has lost its way. There are dog owner groups that help get connect the community, where these dogs can be referred to. What happens to sick dogs? The sick street dogs are supposed to be treated, but BBMP doesn’t yet have the facility to do so for every dog. However arrangements are currently being made to get zonal level medical facilities for animal birth control and hospitalisation. Reports say that there will be eight ABC centers in eight zones of the city, to help serve and control the increasing population of pets and street dogs. Plans are on to get better hospitalisation facilities for all dogs to be treated, including pets and street dogs. You must be wondering how to deal with sick and rabid dogs as well. When a street dog is terminally ill, mortally wounded or rabid, designated experts certify on its health condition, so that they can be euthanised in the kindest method possible. Killing dogs is illegal. But the ABC rules provide guidelines on how a terminally ill dog can be euthanised. Once certified by the experts on the nature of illness, dogs are injected a medicine that euthanises them. No dog is permitted to be euthanised in the presence of another dog. But the treatment of rabid dogs is a little different. When people complain about an ill or rabid dog, the BBMP dog squad will catch it and take it to the pound where it be placed in an isolation ward and under observation for three days. If the dog is rabid, there will be excessive salivation and its behaviour tends to be aggressive. Such dogs will be isolated till they die a natural death, because rabies causes death in 10 days. Samples of the dead dog are sent to designated labs and appropriate action is taken on the issue. The carcasses is disposed of in an incinerator. If the dog is not rabid, it will be handed over to a animal welfare organisation which will then help cure the dog of its illness and rehabilitate it. How to control street dogs in residential streets? Dr Suresh, Animal Birth Control Officer of BBMP, says that household garbage on streets is what attracts streeties. The puppies feed on the garbage, grow big, form a pack, breed, and multiply in numbers. Dogs often migrate from area to area, and from rural areas to cities, in search of food. So the first thing is to make sure the door-to-door waste collection system works in the area, to avoid dogs from being attracted to the locality. But oftentimes, when the system fails dogs increase. Thankfully, there are some rules and regulations meant for protecting street dogs that can be followed to make the neighbourhoods safer without the need to be unkind. One more important point to keep in mind is that if you see female dogs in the area, even if they are puppies, you should call the BBMP’s dog squad so that they can catch them young and sterilise them. This helps reduce a lot of commotion in the neighbourhood during their breeding seasons, and future population of streeties, as well as helps the sterilised dog live a healthy life. 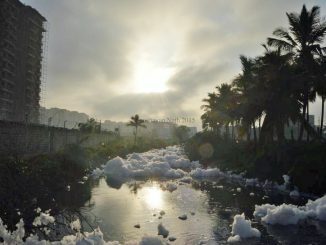 Chief Minister HD Kumaraswamy announced in the state budget that soapnut-based detergent industry will be promoted in future, as it will help control pollution in lakes. Will this solution really help control lake pollution? Thanks for the complete information. For those who can’t get through BBMP or action not being taken, I can also recommend this group called ALAI. I got the street dogs near my house neutered by calling them, they got their van, picked up the dogs, dropped them at Sarvodaya and after a few hours dropped them back at the same location. They don’t charge anything except if it is long distance for which they charge for the petrol costs..but would be nice if one can pay something to them. I have seen them do a lot of street dog rescues. It was a huge relief for me as I was new to Blore and didn’t have a vehicle to do the neutering. They seem to be very prompt. https://www.facebook.com/alairescue. They help only street dogs. There are many FB groups online like Bombay Dawgz or cubbon park canines which has dog lovers in different areas of B’lore who can help with any street dogs issues/rescues. I find them very useful for any dog related information.